... is just a block of wood. This blog celebrates some of the blocks of wood that got opened. The Establishment or the Rebellion? I know Marva Dasef as the author of the gentle, imaginative and exploratory books of the Abu Nuwas series, and so I was looking forward to First Duty, bearing in mind, of course, that this time we are talking science fiction and not fantasy. I’ve also read her other fine books, Lemons and Other Kid Tales and Fish Story, so I grabbed the chance to pick up First Duty on a hefty discount when Marva Dasef did a giveaway. I was pretty confident I’d get something suited for kids of ages 12 -90. No gruesome horrors, wicked but not evil villains, simple but not simplified plots. First Duty does not quite pull off the same standards. Don’t get me wrong: the writing is crisp and the editing flawless, which already lifts the book head and shoulders over most indie books. But it’s in the reasoning that it stumbles. When Abu Nuwas asks a young boy whether it is right for girls to be disallowed from certain activities, he lets the boy reason it out for himself. Nyra, the protagonist of First Duty doesn’t quite reason anything out. She goes from action to action much like a TV serial heroine. There twists and turns in the plot, but none of the mind. Freedom is presented to us as an unalloyed good, losing the chance to explain to young readers what exactly is wrong when corporatisation of whole planets results in poorly-fed slave labour. The desperation of the tall and martial-arts-talented Nyra to get off-planet is there, but there is no back-story to explain why. We know there is inequality in the whole setup, but we barely brush the fringes or implications of it. Nyra survives the initial test (ha, you guessed that, did you?) and the first chapters did bring out a bit of the heartlessness of the system in that cadets could be and did get killed in the last test, for no real reason other than ‘testing’. She then is part of a mission to deliver a rebel to prison, where she gets to know for the first time that there is a rebellion, and what the reasons for it are (freedom, equality). At this point, I felt that Nyra is a naif. But is she? She’s supposed to be one of the smartest cadets, and she is selected, after all, to infiltrate the rebels, once she’s presented that plan as a fait accompli. So, plenty of initiative, smarts, physical capability, and perhaps charm, to be able to convince the rebel leader she is a committed rebel. She meets a lot of rebels, and finds out more about the status of the rebellion on her own home world, something she had been blithely ignorant of. Are real teens that ignorant? It’s possible, but surely a sharp young woman like Nyra would have known something more than she does. Or is she like the many one-track minds one sees alas too often in academia, someone who scores well by single-minded focus, and therefore not a rounded personality with other interests? She goes from adventure to adventure, with a final result you can expect from reading the back cover or my own headline for this post (spoilers? Who, me? Never!) And yet, somehow, it seems not to quite touch her at any depth. Not the unexplained sexism of her first Captain, nor the suspicion of the second. It’s all: huh, I shall prove to you that I am capable. Nyra is too perfect already, there is no scope of showing growth in the character. 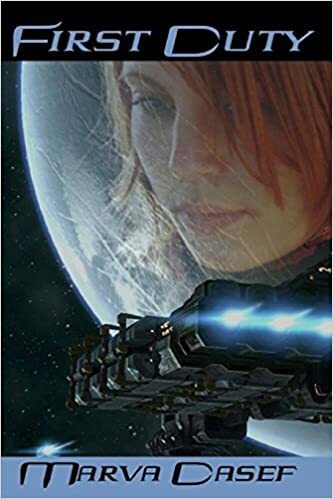 Another lost opportunity is the Vargans, including one of Nyra’s few friends, Smith, who is her contact back to headquarters, someone who follows her into the rebel stronghold under the guise of a romance. Dasef has created a super-race of humans adapted to extreme environments, one of whom is the laid-back Smith. However, the special organs and abilities don’t actually have anything to do in the story. I hope the sequels will put these to better use. All in all, a light read, with a light touch, and a light treatment. Anyway, I’m off to read the first of Marva Dasef’s Witches of Galdorheim. Matt is 17, going on 18, and haunted by visions of the future. As a kid, he'd had a vision of a fire, and soon after, his parents had died, leaving him an orphan, in and out of foster homes. Mr and Mrs Powell, who foster other children than Matt as well, are good people, but Matt worries that his visions of death and pain would envelop anyone he cares for—and they would die horribly--and so all he looks for is to 'graduate' foster care when he hits 18. He's trying not to rock the boat. Then he meets Amara, and Amara's great-aunt. Amara's in his school, and their first encounter is Matt inadvertently and anonymously saving her from a group of bullies. The more Amara tries to understand what Matt is about, the more he tries to push her away. Not that he can. Amara's blind great-aunt reads tarot cards, and sees the 'gift' in Matt. Now, that's the point at which I would normally flap my hands in exasperation and abandon the book, because, I mean, tarot? One step below astrology, the way I look at it. I mean, I was looking at a fantasy book, not a superstition book. 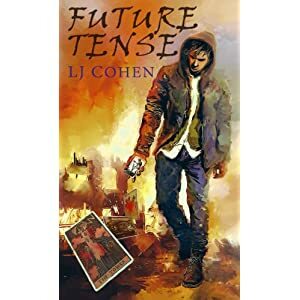 But LJ Cohen's writing dragged me into the story. By the time this came up, I was totally involved with the characters, and I wanted to know how a happy ending could possibly be pulled out of those dark and dangerous visions. It's a fantasy book, and tarot is just a prop for parts of it. You could replace it with potions if that makes you feel happy. (LJ Cohen later told me on her Google+ profile that she uses tarot as a plot-advancing device and does not advocate it, so there. And yes, that does mean the author is accessible to fans). Suffice to say that said happy ending occurs, after a breathless rush through a fast-paced story with characters you really care about, credible villains, heroic actions, and suitable comeuppance for the wicked. Which is not to say it's a bloodless story. People get hurt, some badly. It's all very credible and real, and you feel every emotion along the rollercoaster of the story. Do I recommend this book for young adults of all ages? Whatever happened to Sherkaner Underhill? Single-handedly taking on the aliens, with trusty AI sidekick in tow. All posts copyright Jyoti Dahiya. Drop me an email if you want to quote anything. Links are fine. Simple theme. Theme images by luoman. Powered by Blogger.